Talk about layers of flavor! Bourbon bacon, Italian sausage, Pepperoni, Black Forest Ham, Salami, and Mozzarella! Pair this pizza with a crisp cold brew and you will not leave hungry! 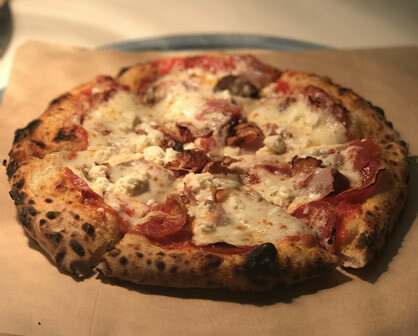 This delicious all-meat pizza is hand crafted and baked in our brick pizza oven. If The By-Pass isn’t your speed, try The Grazer for a delicious veggie covered option!